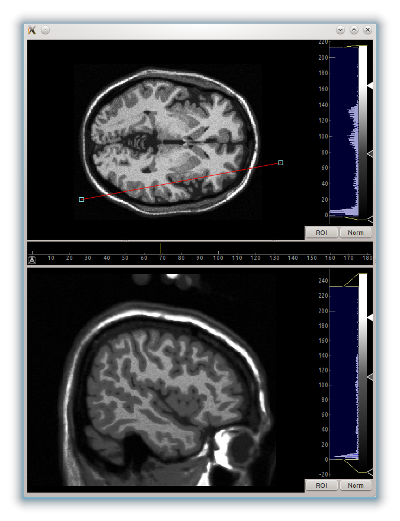 Image analysis with automated data slicing. 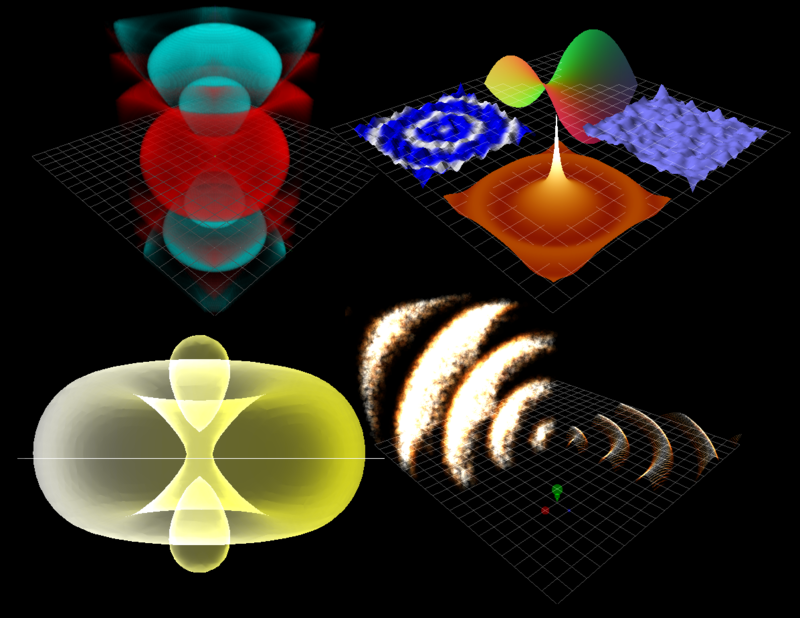 3D graphics: volumetric rendering, surface plots, scatter plots, and isosurfaces. Programmable flowcharts for fast prototyping. 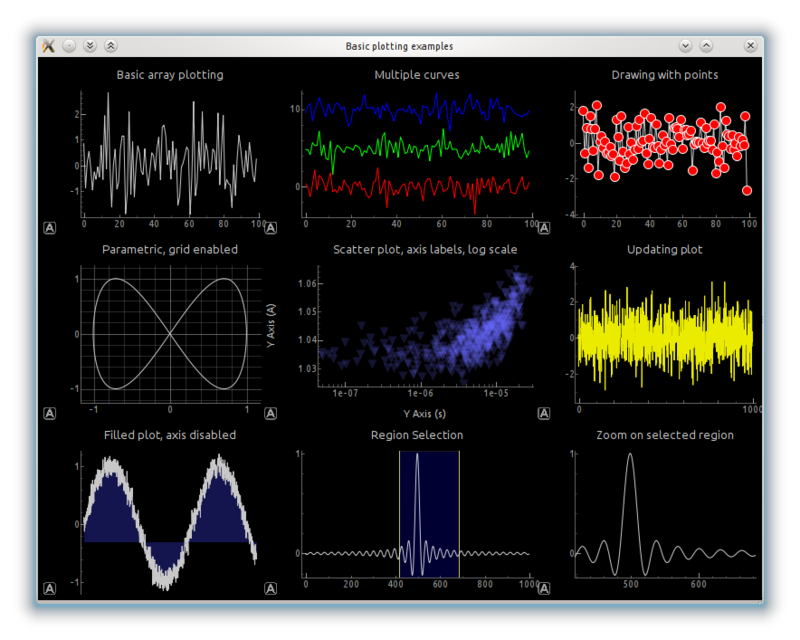 PyQtGraph is a pure-python graphics and GUI library built on PyQt4 / PySide and numpy. It is intended for use in mathematics / scientific / engineering applications. Despite being written entirely in python, the library is very fast due to its heavy leverage of numpy for number crunching and Qt's GraphicsView framework for fast display. PyQtGraph is distributed under the MIT open-source license. 2D graphics use Qt's GraphicsView framework which is highly capable and mature. All graphics use a scenegraph for managing items; new graphics items are simple to create. Flowchart widget for interactive prototyping. 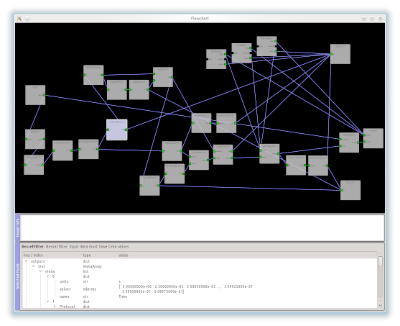 Interface similar to LabView (nodes connected by wires). (similar to those used by most GUI design applications). Interactive python console with exception catching. Great for debugging/introspection as well as advanced user interaction. Multi-process control allowing remote plotting, Qt signal connection across processes, and very simple in-line parallelization. Dock system allowing the user to rearrange GUI components. Similar to Qt's dock system but a little more flexible and programmable. Download the .deb file linked at the top of the page. Many people have generated packages for non-debian Linux distributions, including Arch, Suse, and Gentoo. Check your distribution repository for pyqtgraph packages. Download and run the .exe installer file linked at the top of the page. Download the .tar.gz source package linked at the top of the page, extract its contents, and run "python setup.py install" from within the extracted directory (pyqtgraph is a pure-python library, so no compiling occurs during this installation). Or, install from pypi using "pip install pyqtgraph". 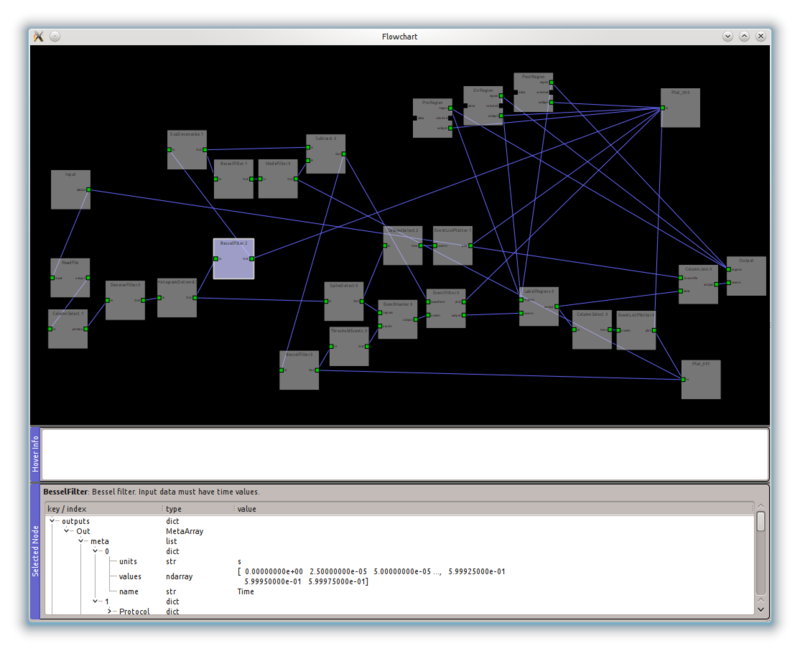 PyQtGraph is known to run on Linux, Windows, and OSX. For versions past 0.9.8, using py2exe is much simpler; see examples/py2exe. Post questions, feedback, and bug reports to the pyqtgraph forum. Or: post questions to Stack Overflow with the tag 'pyqtgraph' (if it's not tagged correctly, I'll probably never see it). 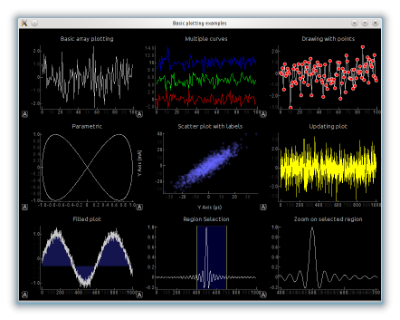 Matplotlib is more or less the de-facto standard plotting library for python. If you are starting a new project and do not need any of the features specifically provided by pyqtgraph, you should start with matplotlib. It is much more mature, has an enormous user community, and produces very nice publication-quality graphics. Speed. If you are doing anything requiring rapid plot updates, video, or realtime interactivity, matplotlib is not the best choice. This is (in my opinion) matplotlib's greatest weakness. Portability / ease of installation. PyQtGraph is a pure-python package, which means that it runs on virtually every platform supported by numpy and PyQt, no compiling required. If you require portability in your application, this can make your life a lot easier. 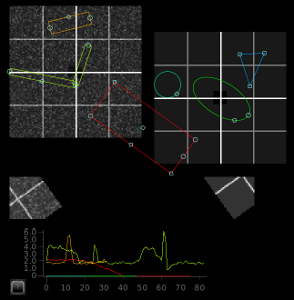 Many other features--pyqtgraph is much more than a plotting library; it strives to cover many aspects of science/engineering application development with more advanced features like its ImageView and ScatterPlotWidget analysis tools, ROI-based data slicing, parameter trees, flowcharts, multiprocessing, and more. VisPy is a new 2D/3D visualization library based on OpenGL that is developed as a collaboration between the authors of PyQtGraph, VisVis, Galry, and Glumpy. 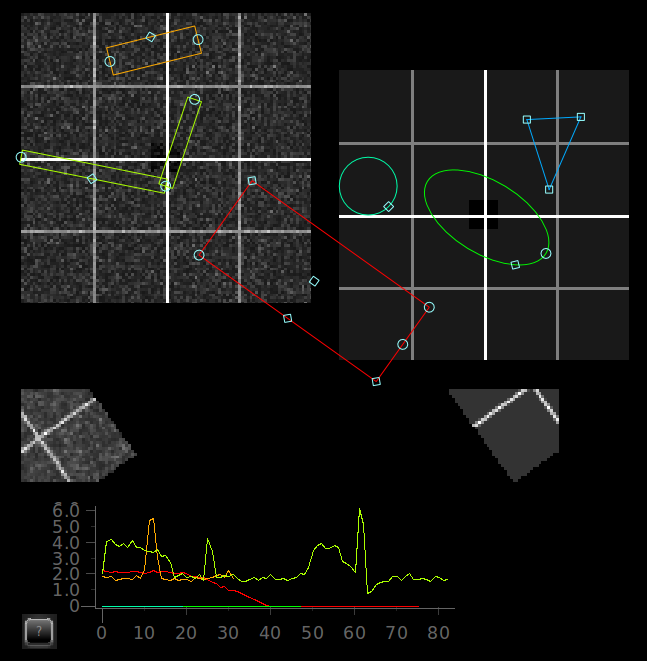 It is presently in early development and has a narrower scope than PyQtGraph--it will focus on visualization without the GUI toolkit features provided by PyQtGraph. In the long term, we hope VisPy will be able to replace Qt as the rendering engine for 2D graphics, and replace the pyqtgraph.opengl 3D system entirely. More about VisPy here. PyQwt has a very nice set of features and is fast enough for realtime work. Its main drawback is that it is currently unmaintained and can be difficult to get working on a variety of platforms. Hopefully in the future it may find a new maintainer, but until then it may be best to avoid PyQwt (the original PyQwt maintainer is currently recommending to use pyqtgraph instead; check their mailing lists for updates). Like matplotlib, PyQwt lacks some of the more advanced features of pyqtgraph. Chaco is a very interesting project--nice graphics, good speed, and actively developed. Like PyQwt, however, Chaco can be challenging to install on a wide variety of platforms and lacks some of pyqtgraph's more advanced features (although pyqtgraph certainly lacks many of Chaco's features as well). GuiQwt is an interesting project with many advanced features similar to pyqtgraph. It is presently based on PyQwt and thus comes with some of its drawbacks, although there appear to be plans to change this in the future.